This chapter introduces the use of middleware tools in applications for healthcare and social services, focusing on solutions designed for Interactive Digital Television (IDTV), and discusses its implications to modern roles for easing patient and caretaker relations. 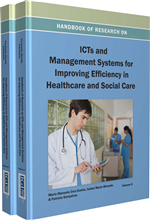 The authors explore the capacities of such solutions to assist the patients in their personal needs, optimizing the time and tasks of the caretaker. They discuss the limits of the use of Internet in satisfying the needs of communication of elderly and other patients, and then they propose new roles for caretaking based on this new reality. The authors also present an architecture that allows the remote use and control of electronic devices via IDTV set-top boxes for the middleware Ginga. They show applications based on this architecture that promote healthcare and social services, as a set of infrared lights coupled to a hat that can be used as input for impaired patients, and how an accelerometer can be used with IDTV applications for treatment and entertainment. Before concluding, the authors point out research directions on the topics discussed in this chapter. The use of Information and Communication Technologies (ICT) in healthcare and social services has its own jargon that we introduce here. Telecare: Service that offers remote treatment for chronic diseases, physic unable (temporary or not), and old people, allowing them to have some quality of life at home with a certain degree of independency. Usually, such kind of application involves the use of sensors to trigger alarms to the caretakers came and help. Telehealth: Uses teleconference technologies to deliver services and information related to health. E-health: This term is mostly used referring to healthcare services through electronic solutions (usually using the Internet). Telemedicine: Subset of telehealth services that uses teleconferencing for examination, diagnosis, treatment and monitoring at distance. Telemonitoring: Use of cameras and other sensors, to monitor patient conditions. Telenursing: Field of telehealth that provides nursing services through telecommunications. Smart houses/homes: Houses that implement the use of home automation (domotics) devices, such as an automatic setting of air conditioning, or the use of sensors to turn on/off lights. Assistive Technology: Assistive, adaptive and rehabilitative devices for people with disabilities, promoting independence for them. Several new tools and techniques have becoming available for working with digital television applications. Interactive Digital Television (IDTV) techniques uses digital television and interactive programs (applications) allowing the home watcher to interact with television contents. Some usual interactive programs are: Electronic Programming Guide (EPG), Video on Demand, Pay per View, alternative cameras, electronic billing, shopping, banking, games, chat and teletext (textual information), besides high-definition video. Information and Communication Technologies (ICT): Field that approaches hardware and software for telecommunications, networking and multimedia. Immersion: The capacity of one feeling inside an artificial or virtual environment, such as a game, a video, or a collaborative virtual environment. Pervasiveness: The capability of computing systems in different platforms and devices at the same time in a distributed way. Middleware: Software between an operation system and applications, it processes O.S. functionalities and provides extra functionalities to applications. Set-Top Box/STB: Simple STBs are called receivers. A STB receives an IDTV signal and converts it in displayable images on the television screen. Device: Any electronic equipment connected to the architecture presented in this work. E.g. : cameras, sensors, automation devices, home appliances, remote controls, etc.